Last week I shared some ideas for sharing the hope of Easter with your kids. Today I’d like to share some of our favorite Easter themed books for kids! The First Easter retold by Catherine Storr – this story begins with the disciples making preparations for the last supper and ends Mary seeing the risen Jesus in the garden. One of the things I like about this book is that is has details from the gospels that are sometimes missing in children’s books, such as the release of Barabbas and Pilot’s wife’s dream. My Easter Basket and the True Story of Easter by Mary Manz Simon – I really like this book as it associates the colors in the Easter basket with the resurrection story. It is a sturdy board book with glittery cut-out pages and has fun, rhyming text. This would be a great book to use during an Easter egg hunt, telling the story with colored eggs to match the text. Benjamin’s Box by Melody Carlson – this book is designed to be used with the Resurrection Eggs, though it also works as a stand-alone book. It tells the story of a little boy named Benjamin as he follows Jesus during his last days and who collects “treasures” that he uses to tell the story. A similar book is Lily’s Easter Party by Crystal Bowman. The Story of the Empty Tomb by Bryan Davis – with it’s colorful illustrations and rhyming text, this book tells the resurrection story. The Easter Story From the Gospels of Matthew, Mark, Luke, and John from Tommy Nelson Publishers – this is a great copy of the Easter story as the text is taken directly from the International Children’s Bible, New Century Version. This version starts with the triumphal entry into Jerusalem and ends at the Ascension. Little Bunny’s Easter Egg Surprise by Joan Hood – while this book is not a religious Easter book, I like the overall message of this book. Here little bunny is the littlest bunny in his family and he is tired of always being so little. Mother bunny tells him that it’s not whether he’s big or little, it’s what’s inside that counts, and Little Bunny learns this when he finds an egg with a special surprise. The Tale of the Three Trees retold by Angela Elwell Hunt – This book tells the story of three trees who have big dreams of being important but who end up being used as ordinary, every-day objects. But each of these ordinary objects take on new meaning when they are used by the Savior. Honestly, I have a hard time reading this book without crying at the end! 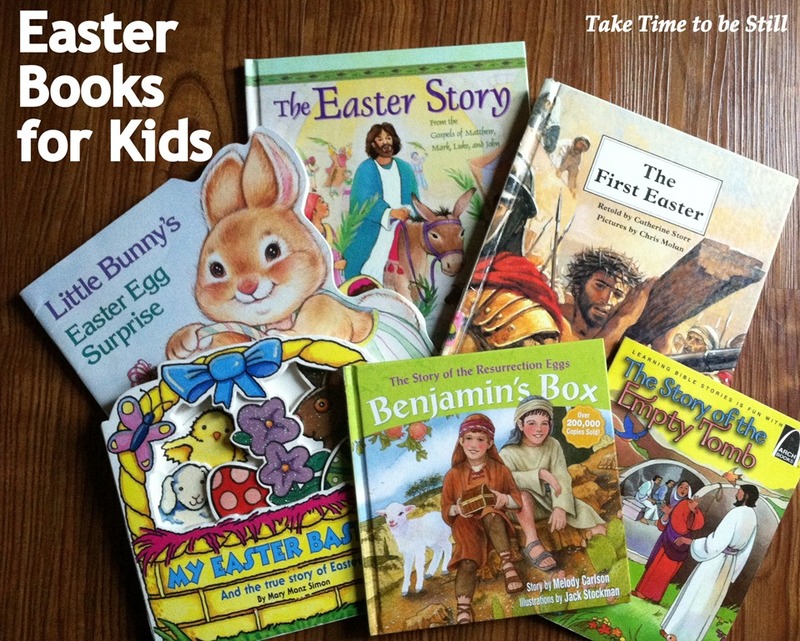 There are lots of other great books about Easter. What are some of your favorites?